Tampa, FL – AAA says that at $2.54, the national gas price average is 7 cents more expensive on the week and 23-cents more than last month. However, today’s price is just as expensive as the same day a year ago. In fact, for the first time since the end of November last year, the national gas price average the past four days was identical or a penny more expensive year-over-year. While the national gas price average is the same price year-over-year, only 20 states can say the same. Across the country, the yearly difference ranges from as much as 25-cents cheaper to 10-cents more expensive. 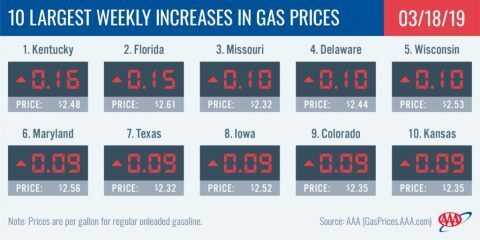 The nation’s top 10 largest weekly increases are: Kentucky (+16 cents), Florida (+15 cents), Missouri (+10 cents), Delaware (+10 cents), Wisconsin (+10 cents), Maryland (+9 cents), Texas (+9 cents), Iowa (+9 cents), Colorado (+9 cents) and Kansas (+9 cents). The nation’s top 10 least expensive markets are: South Carolina ($2.30), Mississippi ($2.30), Arkansas ($2.30), Alabama ($2.30), Utah ($2.31), Missouri ($2.32), Texas ($2.32), Wyoming ($2.32), Louisiana ($2.33) and New Mexico ($2.33). Three Mid-Atlantic and Northeast states land on the top 10 most expensive gas price average list in the country with two states just a quarter away from hitting the $3/gal mark: Washington, D.C. ($2.75), Pennsylvania ($2.75) and New York ($2.66). On the week, gas prices are as much as a dime more expensive with Delaware seeing the largest jump. Month-over-month, five states in the region have averages that are a quarter of more expensive: West Virginia (+30 cents), North Carolina (+27 cents), Maryland (+27 cents), Virginia (+25 cents) and Tennessee (+25 cents). [320left]The Energy Information Administration’s (EIA) weekly data puts total stocks for the region at 63.5 million bbl following a draw of 1.4 million bbl for the week ending March 8th. This is the lowest regional stock level seen this year and is a 4 million bbl year-over-year deficit. The tightened stocks can be attributed to exports as well as to planned and unplanned refinery maintenance during the winter season. As maintenance wraps up and refineries increase runs, stocks levels are expected to increase in coming weeks, which will hopefully help to stabilize gas prices. 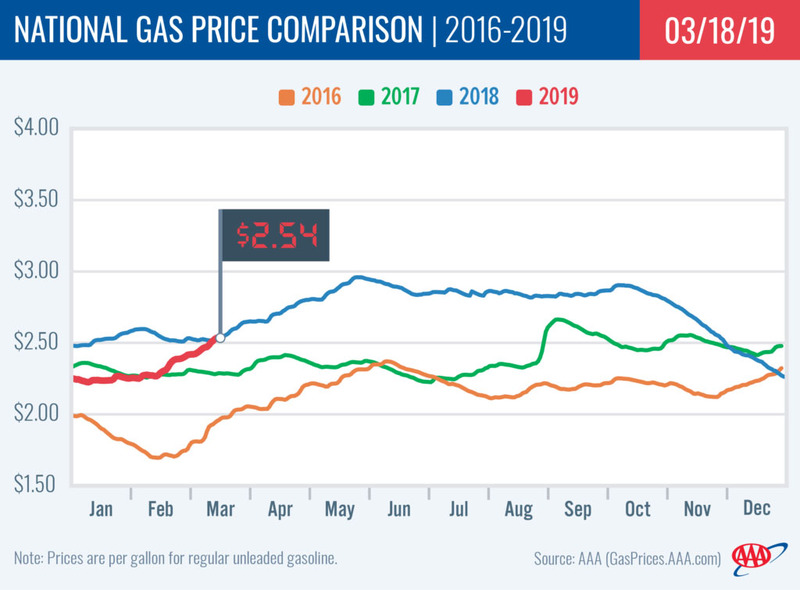 State gas price averages in the Great Lakes and Central States are as much as 16-cents more expensive on the week, but 33-cents more expensive on the month. In fact, six states appear on the top 10 list for largest month-over-month increases: Iowa (+33 cents), Minnesota (+32 cents), Kentucky (+31 cents), Wisconsin (+29 cents), Nebraska (+29 cents) and North Dakota (+29 cents). Other notable moves on the week: With a nickel increase on the week, Illinois ($2.62) now carries the 10th most expensive gas price average in the country and highest in the region. Ohio (-10 cents) was the only state in the region and country to see gas prices decrease on the week. As regional refinery utilization holds steady, gasoline stocks took a large 1.5 million bbl draw on the week, according to the latest EIA data. The sustained drop in stocks since mid-February continues to be a driver toward more expensive gas prices. Total stocks sit at 56.8 million bbl, which is the lowest for the year and a 3.2 million bbl deficit over this time last year. One week after being the only state in the country to see a pump price decrease, Florida (+15 cents) saw the second largest increase in the country this past week. Also joining Florida on the top 10 weekly change list is Texas (+9 cents). New Mexico (+4 cents) saw the smallest increase of all the South and Southeast states. [320right]While gas prices have been steadily increasing in the South and Southeast, only four state averages are more expensive year-over-year by a dime or less: Florida (+8 cents), Alabama (+2 cents), Mississippi (+2 cents) and Texas (+1 cent). Since the beginning of February regional gasoline stocks have consistently tightened. The EIA’s latest data reports show that the South and Southeast region had the largest draw of any region in the country with 1.7 million bbl. Total stocks register at 85.5 million bbl. While one of the lowest levels this year for the region, it is comparable to levels at this time last year. Despite increasing gas prices, two states from the region carry among 10 of the cheapest gas price averages in the country: Utah ($2.31) and Wyoming ($2.32). On the week gas prices are 4 to 9 cents more expensive across the region. Of the Rockies region states, all but Colorado land on the top 10 list of states for the largest difference in year-over-year gas prices: Montana (-20 cents), Idaho (-17 cents), Utah (-11 cents) and Wyoming (-9 cents). With a 59,000 bbl add, gasoline stocks bumped up to a total of 7.4 million bbl, which is low compared to historic data for this time of year. However, stocks have held steadily above the 7 million mark all year and helped to keep gas prices on the cheaper side. Motorists in the West Coast region are paying the highest pump prices in the nation, with most of the region’s states landing on the nation’s top 10 most expensive list. Hawaii ($3.35) and California ($3.34) are the most expensive markets. Washington ($2.96), Nevada ($2.86), Oregon ($2.85) and Alaska ($2.81) follow. Arizona ($2.53) is the only state in the region that dropped from the 10 most expensive markets list. All prices in the region have increased on the week, with Oregon (+5 cents) seeing the largest jump. EIA’s recent weekly report showed that West Coast gasoline stocks remained virtually unchanged from the previous week and now sit at 32.78 million bbl. Stocks are approximately 350,000 bbl lower than at this time last year, which could cause prices to spike if there is a supply challenge in the region this week. In related news, the Phillips 66 Carson refinery near Los Angeles reported a fire at one of its crude processing units on Friday, which caused the 139,000 b/d refinery to close the unit while the fire is under investigation. At the close of Friday’s formal trading session on the NYMEX, WTI dropped 9 cents to settle at $58.52. Oil prices took a hit last week as the market continued to have concerns about the global economy slowing this year, which could weaken global crude demand later this year. Moving into this week, prices will likely remain volatile following news from OPEC that it will not hold a meeting this April regarding its crude reduction pact with other global crude producers. Instead, OPEC will meet on June 25-26 to allow the cartel more time to determine if it should work with its partners to extend the crude production reduction agreement beyond June. Prices were also volatile last week after new data from EIA revealed that total domestic crude inventories declined last week by 3.8 million bbl to 449.1 million bbl, which is roughly 20 million bbl higher than last year’s level at this time. Some market observers believe increased crude production from the U.S., which hit 12 million b/d last week, will help to meet global crude demand as global supply tightens due to OPEC’s 1.2 million b/d reduction agreement in place for the first six months of 2019 and U.S.-imposed sanctions on crude exports from Iran and Venezuela – two major global crude producers. In related news, Baker Hughes Inc. reported that the U.S. lost one oilrig last week, bringing the total to 833. When compared to last year at this time, there are 33 more rigs this year.